In Saturday’s Newsletter I mentioned the “Soda Bottle” greenhouse. The reference prompted a few readers to ask “What kind of Greenhouse is that”? If you read the About Me page you would know “in the beginning” I collected plants – specifically rare and unusual Anthuriums. Many times as a collector you may acquire a – one-of-a-kind – never to get your hands on again, cutting. What we use to call a “crumb” – basically a small almost nothing of a plant which may have a small “eye” where some growth – if properly nourished – would someday grow. Even in a greenhouse where the controlled conditions exist, sometimes more is required to improve the plant growing environment. To accomplish that I would buy clear plastic sweater boxes. In the boxes I would put a layer of perlite and either some moistened peatmoss or sphagnum moss. Water was added to create a “moisture heavy” environment when the plastic lid to placed on top. On top of the peat or sphagnum, tiny seeds or these “small crumbs” would sit, in a great atmosphere for rooting. Basically it is a terrarium, a small greenhouse. One downside to the plastic sweater boxes – easy to crack and break. The concept isn’t new and I did not invent it. However, today, I make these mini greenhouses from disposable soda bottles. I like clear over green, straight sides if possible and use small ones to as big as I can get. These make great mini greenhouse rooting containers. 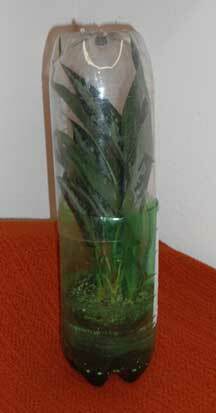 Once the plant has been rooted, you can pull off the top, leave the plant in the soda bottle, and continue growing it the same container the plant rooted in or transplant. I do it both ways. I use them to root cuttings, sprout seeds and grow indoors, or get a jump on spring crops. The bottles are easy to label if needed and you can keep a wide variety of plants in a small space. Throw in some grow lights, you will be amazed at how in a small space you can have plants all year round indoors. I’ll root cuttings, establish and grow the plant on, then give the plant away to a friend. Later on I’ll hear back how they are amazed at how well the plant is doing and how easy it is to care for. For tall cuttings, take 2 bottles and stack them. For growing houseplants these cannot be beat. The soda bottle growing container makes indoor plant care SIMPLE. Over-watering – GONE. No special soils for different plants. Plus, they open up a whole new world of potential containers to use indoors. This simple addition or technique takes growing plants – especially indoors – to a completely different level. It takes so much “guess work” out of indoor houseplants. I am all about simple. I have to thank Bob Hyland for reminding me about this simple technique. Over the next few days you’ll see a few in action. Stay tuned!